My rabbit took all her straw out of her nesting box and built a cool nest in the corner of her huge cage. Is that okay or does that mean she will be a bad mom? What you want to do is move the nest box into the corner where she has built her nest at. Put the nest back in the nest box in the corner she wants. The babies will probably die if the doe has them on the wire, so that's why you should move the nest box to where she put her nest. Put yourself in the rabbit mom's head - she knows she has babies on the way, and instinct tells her that she should be digging a burrow. So, you give her a nice box that simulates a burrow all decked out with nesting materials. She sees the straw and everything, but not the 'burrow.' So she takes what you give her and builds her nest as best she can. I'd say that looks like a doe with a strong mothering instinct, pretty much! By the way, quite a few does have been known to do this. 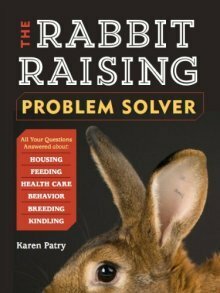 First, review the Raising-Rabbits.com page on nesting boxes just in case (get to it by clicking on 'Breeding Rabbits' in the navigation bar to the left). Then, move the nest box to the corner where your doe put her own nest. Vacate the corner by putting all the materials back into the nest box, or if you can, maybe try to lift her carefully constructed nest in one piece and place it in the box, so that the nest and box are where she put her nest. There's a pretty good chance she'll figure it out with this little bit of help from you.